A University of Washington welcome for new students, their friends and families. New Student Convocation is one of only two occasions where the University president, the Board of Regents, the deans of the 16 schools and colleges and the faculty gather in a formal academic setting focused on students. The other, of course, is the graduation ceremony, Commencement. These two events are the seminal “bookend” events of a college career. Find out about your classmates from the Dean of Undergraduate Academic Affairs. Get tips from your student body president on how to make the most of your college experience. Learn about some of the exciting educational opportunities that await you. Upon arriving, students and guests (parents and friends) will be directed by faculty marshals to their respective seating sections (see arena seating map). Tickets are required for entry to the Arena. Following the convocation, President Ana Mari Cauce will host the twelfth annual President’s Picnic under a giant tent set up on the Rainier Vista lawn (see map). At the picnic, incoming students and their families and friends will have a great opportunity to chat informally with the president and meet many of the University’s faculty members and key administrators. There will be music, delicious food, a special appearance by the Husky marching band and cheerleaders, and lots of fun. Tickets may be ordered when you order your convocation tickets. Why do we have commencement and convocation ceremonies? 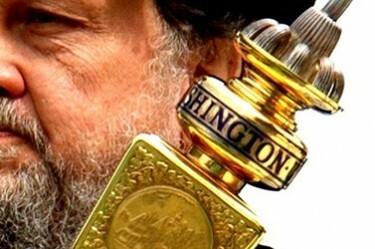 Learn more about ceremony and tradition at the University of Washington. 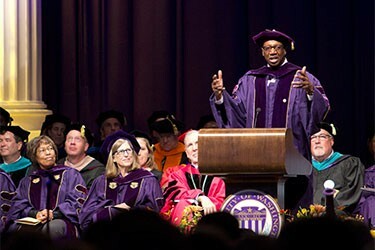 There are four key ritual elements that are seen at University of Washington academic ceremonies. They express our history and traditions. The columns that form the backdrop for our stage at convocation and commencement hold special meaning for the University of Washington. University of Washington ceremonial occasions begin with the entrance of the University Mace, carried by the University Marshal. If you wish to attend Convocation and the President’s Picnic, you must order electronic tickets for both events. When the order form is active, the above button will take you to the order page. New Student Convocation tickets are complimentary. Picnic ticket prices are as follows – Adults: $25; Students: $20; Children 12 and under: $10. When ordering, you may also request parking permits and any disability accommodations needed. Just post content to your favorite social networks using hashtag #NEWHUSKIES2019. Be sure to set your post/profile to public and check the box to send Vine posts to Twitter.